Psychotherapist Frieda Klein just might know something. One of her patients describes dreams of seizing a boy who is the spitting image of Matthew. Convinced at first the police will dismiss her fears out of hand, Frieda reluctantly finds herself drawn into the heart of the case. A previous abduction, from twenty years ago, suggests a new lead - one that only Frieda, an expert on the minds of disturbed individuals, can uncover. Struggling to make sense of this terrifying investigation, Frieda will face her darkest fears in the hunt for a clever and brutal killer. This book is a little different from your other detective thrillers. This is the POV from a psychotherapist, what makes it different. When you put the pros and cons next to each other, it was an average book. Nicely written: This book is a nice read and you can speed through it, even if you're not really fond of the book. The story develops very fast and it never feels "slow" in any way. Eventually all the people in this book play their part and add something to the story. Conversations: I LOVED the conversations in this book. It's just a straight up conversation, like the ones in real life. It's not the "he said, she said" thing, with a lot of useless information between the lines. I was looking forward to the conversations the whole book. This was really one of the greater parts, in my opinion. Psychotherapist: The POV in this book is unique to me. I've never read something where a psychotherapist is involved. This gives a whole new layer to the crime genre, what makes this book unique in it's genre. Not thrilling enough: When I finished the book I kinda felt numb. I wasn't thrilled or shocked, I didn't really feel anything. The book never really gets this thrilling vibe, where you want to keep reading to figure out the plot. Frieda Klein: Altough this woman feels like a strong one, who is an expert in her field, she feels cold. It's kinda felt like she doesn't grant herself permission to be happy. She doesn't want the loving boyfriend, she want's to walk in the cold, dark, empty city, she want's to come home alone, to sit there alone.. It felt like too much punishment for herself. I didn't really get an explanation why she is treating herself that way. It interfered with me seeing her as this strong woman. Unbelievable story: The plot as a whole story feels a little bit unbelievable. I can't tell you too much without spoiling, but it's just too much coincidences stacked up on top of each other what makes the plot. "Fast-paced and spooky... it leaves readers with the promise of intriguing tales to come." "A neat puzzle with a satisfying resolution and a terrific twist at the end." "Unrelenting... Unnerving... Unforgettable. Psychologial dynamite." What's your favorite character from a detective/thriller series? I always have issues reading books that include child abductions! The scenario is just too horrible for me. I can totally understand. So you didn't read Blue Monday? 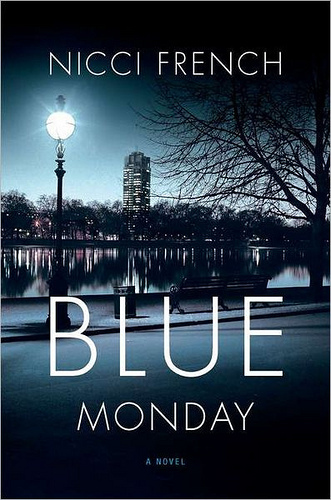 Personally, I haven't read Blue Monday. Hopefully I can read it, it's on the list. Maybe I'll read it later this year... Good review! Have a Fantastic Friday!